Mom & Grandma went to an Open House over the weekend and brought back some new fabrics, including widebacks, new Star Wars, some interesting swirly fabric with coordinates & a bunch of other fabrics! Plus new rulers, notions and cool bin kits you can make. They still going through everything they brought back plus some new fabrics and notions that were delivered while they were gone. I'll have to send out another newsletter when they get organized from all the stuff they have to get into the computer. Grandma has been busy getting the Free Demo & Pattern block ready for Saturday, October 10th and trying to get caught up on some other projects for around the Shop. I can't believe September is gone already and October is here! As most of you know, I wasn't in the Shop much in September. I was at home trying to nurse Mom back to health. She got a really, really bad virus that she couldn't seem to get rid of. I think she's finally on the mend. I guess my doggie sisters and I are pretty good at this nursing thing. 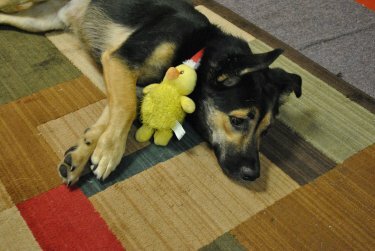 We took really good care of her. I went into the house at the beginning of September when it was really nice out and when Mom was finally able to get out of the house it was getting pretty chilly outside. She wants to know where the warm weather went to. I could go outside and play when she was sick so my sisters and I were able to enjoy the nice weather. 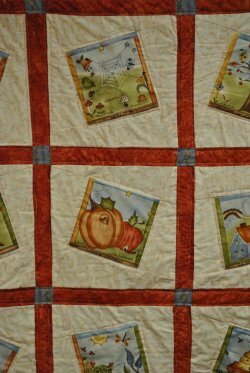 Now that the leaves are falling and the weather is starting to get a wee bit nippy, it's time to gear up for...you guessed it....Quilting Season! Mary Lou will show you a new way to get your lights, medium and dark color in one easy step, too. Get a free pattern and see a short demo on some tips and tricks to make the block. prize for bringing a Show and Tell of last month's demo. We apologize for forgetting about the Show and Tell. No small pieces to cut, it's and easy, fast project. It makes a great guy quilt. Deep colors and cozy flannel! What more could you want! 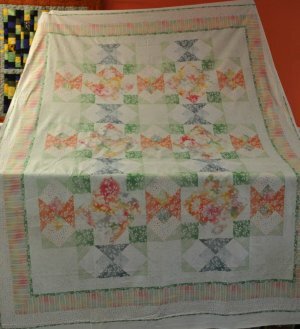 This quilt uses fabric from Quilting Treasures Mimosa fabric collection. Best of all, the pattern is free! Look at all of these beautiful bright colors! 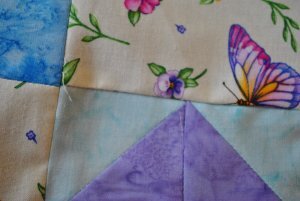 Putting this quilt together will brighten the gloomy days ahead of us! 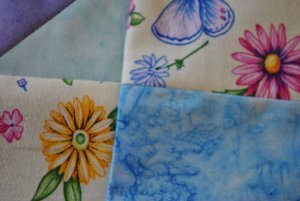 Looking for a new setting for panel squares? How about tipping them at an angle. There is no separate sashing to make these wonky blocks. There is still room left in all of our October Classes. Come on in and sign up for a class today! 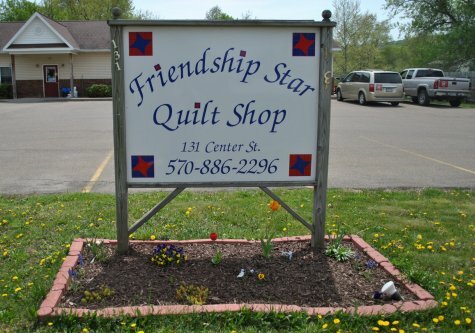 Take 10% Off Fabric purchased for your class at the time of sign up! 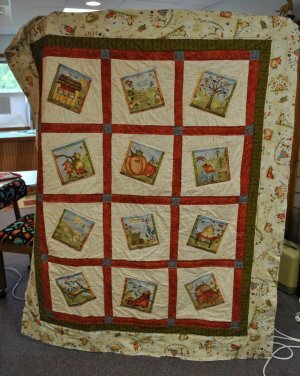 We also have a Show and Tell Quilt for this month's Newletter! 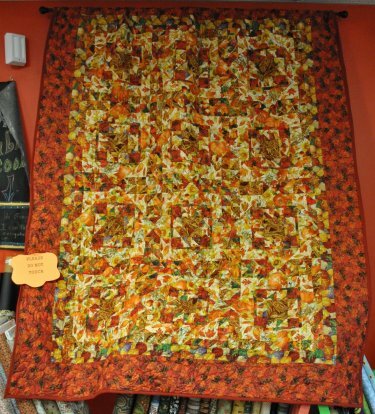 Denise A. made this beautiful Fall inspired quilt out of Fall fabrics she bought from our Shop. 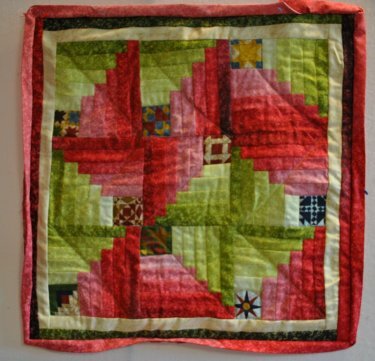 A reminder to the quilters that signed up for Cathy Brown's One Block Wonder Class on October 8th for Endless Mountain Quilt Guild. We have the book for your class. It is $17.95 + tax. You will need this book for the class. 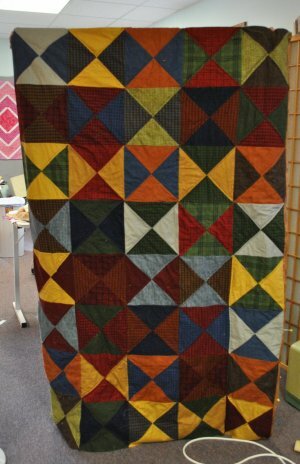 We also have some really nice fabrics that would make a great One Block Wonder quilt. I think I covered everything for October. Have a great Halloween! I think I'll be a bear rug for Halloween this year. Here's my costume idea. What do you think? Don't forget, we always have an unadvertised Daily Deal and if Mary Lou is in the Shop, she will be happy to schedule a class that suits your busy schedule if you are unable to attend ours. The exception is the Free Pattern and Demo Day. Our classes are never cancelled due to lack of attendance. As long as one person is taking the class, we will have the class. The only exception is if the instructor is ill or inclement weather. Have a great week and we hope you will visit us soon!